August 2018 – Sue's Reviews. Elliot was always on business, leaving Louisa to her own thoughts. She never doubted his loyalty to her. He’d had some trouble a year or so ago and this worried Louisa more than anything. Then one day her perfect world came crashing down around her. Elliot was late home, they were having guests for dinner and he had vowed he would be back before they arrived. But tragedy arrived at her door instead; the local police officer brought the news that Elliot had been killed in a driving accident earlier that day. Elliot’s death opens up a huge can of worms that leaves Louisa desperate for answers but giving her only more questions. Beautifully written and with plenty of action this book will entertain from start to finish. As you read through you become engrossed in Louisa’s story, her emotions envelop you as the depth of Elliot’s betrayal is uncovered and the danger he has put his young widow in. This is a book I would definitely recommend. 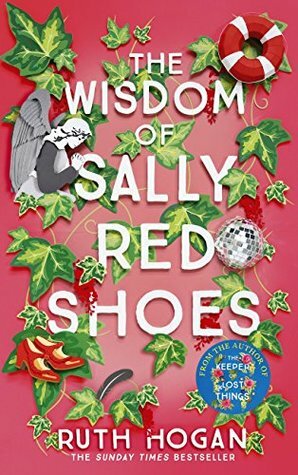 Review of The Wisdom Of Sally Red Shoes by Ruth Hogan. What an absolute joy this book was! This book will hold you in thrall right from the first page. Narrated from the point of view of Masha and also Alice, you sense really early that Alice plays a pivotal role in Masha’s life. Masha lost her son many years ago. She believes he drowned. She is a wonderfully complex character who I loved instantly. She frequents her local cemetery and tends to the graves of many people. She encounters a wonderfully eccentric woman, whom she dubs Sally, and this character adds a lovely layer of depth to the unfolding story. Masha life is shrouded in grief. The loss of her young son has left a void in her life and the lives of those closest to her. The love that Masha had for her son has been transferred to her beloved Wolfhound, Haizum. The dog’s character is every bit as lovable as Masha. The book deals with grief and how it engulfs people. It also deals with cancer. We discover Alice has cancer and her life seems to unravel because of this illness. The secret that Alice has been keeping for many years spills out towards the end of the book. The author draws us into Alice’s world by writing about how cancer is sucking the life out of her and exposing her secrets. The characters in this book are colourful and they invite you into the story. Kitty Muriel is adorable. Elvis comes alive, having first being presented as just another eccentric. Masha’s friendship with both Sally and Kitty Muriel feels so vibrant and exciting. These two ladies offer Masha so much love and hope and those feelings jump out of the book and envelope the reader with the warmth that is being evoked within the story. I am not writing anything about the plot because I want you to go and read this book and allow yourself to be drawn into the story. Every aspect of the story has such a colourful depth to it and to disclose any details would distract from the enjoyment you will feel once you read this book for yourself. I loved everything about this book, from start to finish. I highly recommend it and give it a resounding five plus stars!!! Sara Field has a unique gift, she sees colours. How I understood the colours that Sara saw was like an aura around the people and objects she saw them around. Sara starts off the story living with Greg, who is a successful business executive. Despite feeling the loss of her parents and all but losing her ability to see the colours, Sara feels she has a happy life working as a teacher and living with Greg. But Greg betrays her by cheating on her, and she loses her beloved job. Just as she’s starting to put her life back together an invite to the Tres Piedras Ranch in Colorado arrives. Her sister’s future father-in-law has invited the bridal party to the ranch for a get together before the wedding. Sara finds out that Greg is also going to be at the ranch as he is very close to the groom’s father. She decides to stay for the sake of her sister, determined not to let Greg ruin anymore of her life. At the ranch Sara meets Rick. The two share a connection that is beautiful and heart-warming, but Rick has his own grief to deal with. Can the two of them move past their issues and find happiness? Will Greg or the manipulative Kelly get in their way? The story is heart-warming and captivating. Sara is a gentle woman and I warmed to her immediately. Greg irritated me beyond belief, as did a couple of the other characters. Rick’s pain and grief were obvious as soon as we were introduced to him. I found that this made me want everything to go their way and also drew me into the story all the more. The writer describes the ranch and the surrounding area in such detail that the reader is left with captivating images in their mind. Each sentence entices you into the story and you find yourself lost in the world of the author’s making. A gentle love story that has the right combination of sweet moments and angst to keep you captivated until the end.